ACCEL Motorcycle 2002MW Exhaust Wrap - Matrix Wrap - 2 in. x 25 ft. 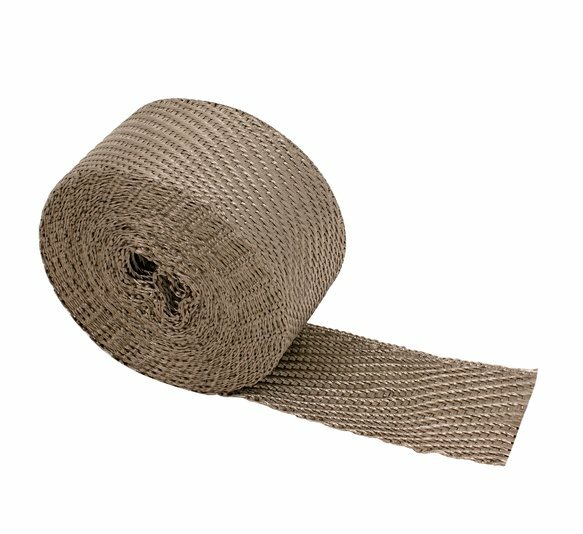 Exhaust Wrap - Matrix Wrap - 2 in. x 25 ft. This Matrix motorcycle exhaust wrap is 2 in. thick by 25 ft.
Our short exhaust rolls are the perfect motorcycle exhaust insulating wrap for your Harley Davidson, dirt bike, metric, go-cart, or quad. Exhaust wrap helps to retain heat in your exhaust system, which increases horsepower while reducing radiant heat damage. By wrapping the exhaust system it maintains hotter exhaust gases, decreases the density, and allows the exhaust gas to exit the system faster! Greater exhaust scavenging is produced and lowers intake temperatures: that equals more horsepower. It also adds to rider comfort, by reducing burns caused by exhaust pipes coming into direct contact with your legs or can even protects fairings from melting. Woven from crushed volcanic rock or "Basalt"